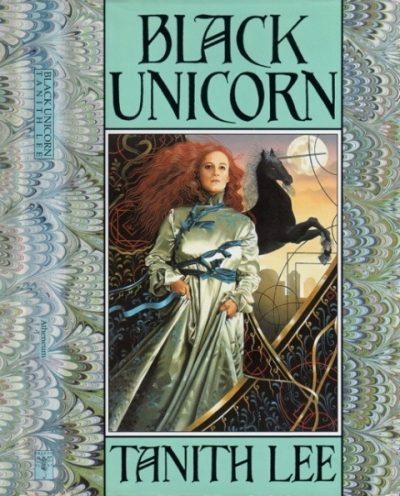 1991’s Black Unicorn is the first volume in Tanith Lee’s Unicorn trilogy. Like last week’s Shon the Taken , Black Unicorn is a juvenile. Young Tanaquil does not have a jot of magical talent (unlike her sorceress mother Jaive), not does she have much patience with a life constricted by her mother’s rules and whims. Life in a magical palace in the desert is tedious and annoying by turns. Long and slender, unhuman, not at once identifiable, the material from which it was made glowed like polished milk-crystal. And in the crystal were tiny blazing specks and glints, like diamond—no, like the stars out of the sky. Tanaquil does have one talent-with-a-capital-T: she’s very good at repairing broken items. It does not take her long to find and reassemble the eldritch skeleton her peeve found in the desert sands. Much to her surprise, it is the skeleton of a unicorn! It is even more of a surprise when the reassembled unicorn revives and drags the enthralled Tanaquil out of her mother’s fortress and into the forbidding desert beyond. Tanaquil’s story does not end in thirst and starvation in the desert. Instead, she uses her tinker skills to bargain her way into a caravan headed for distant Sea City. In Sea City, Tanaquil continues her quest for an independent identity. She comes to the attention of the city’s guilds, who take a very dim view of independent tradespersons setting up for themselves within the city walls. They take an even dimmer view of independent tradespersons whose pets eat guild icons in the middle of initiation ceremonies. Tanaquil’s story does not end with a gruesome execution at the hands of affronted guildmasters. She is saved by the chance intervention of Princess Lizra, who is isolated and desperate for a friend … just like Tanaquil. Who is more closely related to Tanaquil than either of the girls at first suspect. They’re half-sisters! Tanaquil’s story does not end with a lost sister found and a new family forged. The Unicorn is not finished with Tanaquil. Tanaquil tried the tea, then peeled the orange cautiously. As she split the segments a bird flew out. Once away from her mother, Tanaquil does pretty well for herself, at least as long as her garrulous pet peeve isn’t complicating matters. Tanaquil does have genuine strengths, even if they aren’t ones her mother considers important. We don’t get to see anywhere near as much of Lizra, but she seems to be in much the same situation: isolated by her social position, befriended only by people who try to take advantage her. She and Tanaquil seem made for each other, at least until the plot comes roaring back at them. The tone of this book is much more upbeat than Shon the Taken, which makes certain events towards the end of it much sadder than they would have been in a novel I was expecting to end on a down note. At least this is the first novel of three; maybe Lee walks back the plot a bit from where she leaves it here. No doubt I will find out. Black Unicorn is available from Kindle.